In a small bowl, mix together pork, 2 tablespoons soy sauce, 2 teaspoons corn starch, and sugar. Set aside. In a 3 ½ quart pot, heat vegetable oil on medium flame. Add pork mixture and break it up as it cooks. Stir until cooked through. Add tofu and water. Stir, but try not to break it up too much. Add garlic and chili garlic sauce. Bring to a boil. Turn the heat down to a simmer and heat uncovered for 20 minutes, stirring occasionally. Stir in frozen peas (if using) and cook for 1 minute, until peas are no longer frozen. (I’ve also made this with edamame before and it’s a great variation. Depending on the strength of your soy sauce and the amount of water the tofu releases, you may have to adjust. Taste and add soy sauce if it’s not salty enough. If the sauce has not thickened enough, mix 1-2 teaspoons cornstarch with 2 -3 teaspoons water to form a slurry, and stir that in, in a slow stream. Serve immediately. I love it on top of rice. posted by jessica	at 02:06 PM	Filed under Chinese, Recipes. You can follow any responses to this entry through the RSS 2.0 feed. Both comments and pings are currently closed. Both look like pure comfort goodness! 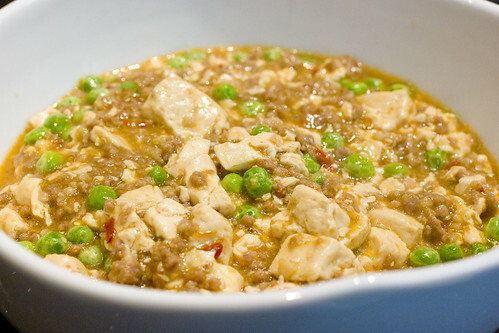 YEAH for ma po tofu…one of my favorite’s. It is awesome that this dish was one of your first learned, kind of like my risotto. 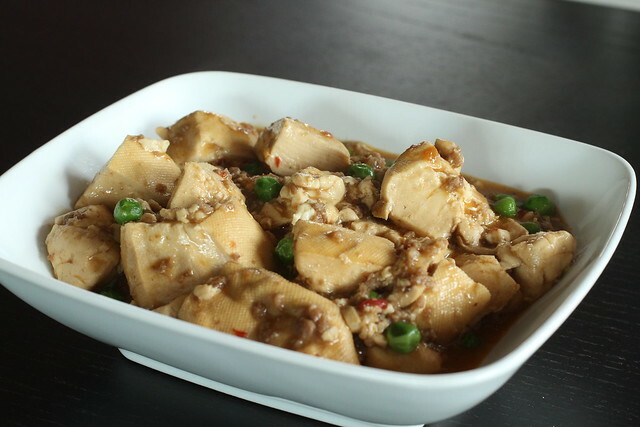 I love ma po tofu, but yours looks much better than what I’ve had in the past. I have never seen any liquid, just dryness, so this is a welcome recipe that I’ll probably try next week given I have both pork and tofu on hand. I’m really looking forward to recreating this, and I think husband will like it too–tofu is hard to palate for him, but when it’s paired with pork I doubt he’ll protest! Thank you! I love this dish. This looks really good! And healthy! Well, I’ve never had this, but it looks and sounds like it could very easily become a new favorite. Where can you find chili garlic sauce? Is it in Asian grocery stores? And if you don’t have it, can you use anything else as a substitute? Christina, welcome to our world! Yes, chili garlic sauce is available at Asian groceries. If you can’t find it, you can use sriracha, but it will be a bit different. Szechuan peppercorns are an essential ingredient to get the taste right. My Taiwanese mother-in-law loves my own recipe that I perfected from combining several recipes that I read. I’ll be glad to share. I stir fry 3 or 4 cloves of diced garlic with an equal amount of diced ginger until slightly browned, add 3 sliced scallion onions and stir fry an additional minute. Then add chili bean sauce to taste, about 1/2 tsp Szechuan peppercorns, 1 tbs fermented soy paste, 1 cup of water and 1 pack of soft or medium firm diced tofu. When it simmers, thicken appropriately with cornstarch and garnish with freshly chopped scallions, then serve over rice. Hope you like it! I was writing the recipe from memory at work; two changes to add: I used chili garlic sauce, not chili bean sauce, and don’t forget to add soy sauce to taste, 1 or 2 tablespoons. Thanks Marc. Which fermented soy paste? Don’t remember the brand off hand, and probably couldn’t read the name anyway, and because it doesn’t last too long after its opened, I can’t check the frige. It is light tan in color and comes in a celophane soft wrapper that I got at H Mart.